Yes… I confess. As much as I love Riesling, it was always German Riesling I used to reach for. Or almost always — one cannot deny the sheer power of Austrian wines, or the lithe, stony structure of Rieslings from the Alsace. But New York State ? The Finger Lakes? I seriously doubted the quality of Riesling that can be made in such a climate. Oh, I did taste a few here and there. Some bottles end up in New York City, especially with the growth of the locavore movement. But these did not impress, and why would they? I do not expect to be wowed by most early-drinking, by-the-glass selections in the restaurants. Call me a snob — but that’s not who they are for! Wines that best represent a region need time, and care, and, frankly, carry a price to match the quality. And on the restaurant list that often puts them at a disadvantage — for now — because they are still “unknown”. And thus, I arrived in the Finger Lakes with a list of names from Lenn, and an open, though skeptical, mind. If there is one name that I knew before my arrival — it was this one. And Wiemer was going to be my first appointment in the Finger Lakes — the one to judge all others by. This was surely no accident. 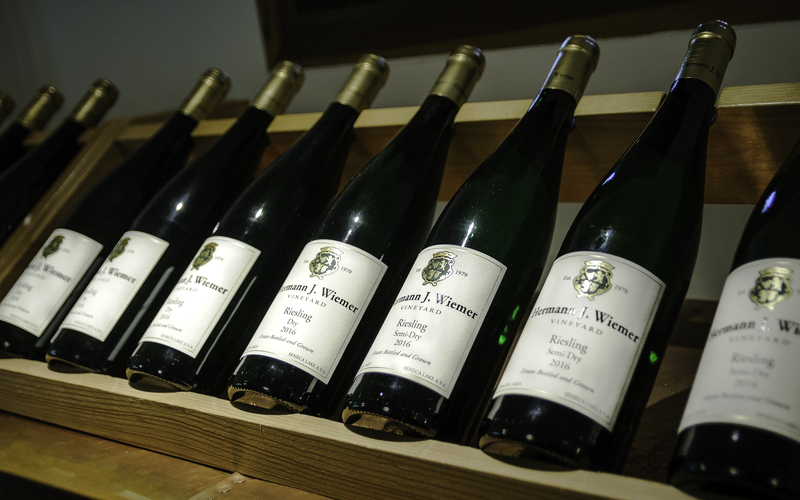 Wiemer’s wines are clearly at the top of the quality ladder. They regularly garner excellent reviews and with good reason. The winery itself is both an established giant, and, yet, a constantly evolving and innovative enterprise. The labels proudly carry “Est. 1979” (my birth-year) on them; though perhaps this may seem “young” when compared to the centuries-old traditions of the Mosel where Hermann Wiemer was born. He was a pioneer of the region and his well-chosen sites are one of the reasons for the high-quality of the wines. Thanks to several friends, I was lucky enough to touch base with the co-owner of the winery, Oskar Bynke, and he greeted us warmly on our arrival. We walked through the beautiful space – I especially loved the mix of modern elements with the rustic barn, like the light fixture above. Yet, once the cork was popped, the map, the decor, the sunny afternoon, all faded away. This was Riesling. From the first whiff, I knew that I had been missing out. What took me so long to get to the Finger Lakes?! Oskar started us off with the HJW Single Vineyard Riesling; I think he wanted to knock me off my balance, curve ball out the gate, no time to get my bearing straight. Whether it was his intention or not, the damage was done. I was no longer in the Finger Lakes. “Pfalz?” I uttered, shocked by the clear pineapple tones and mineral notes. I think Oskar approved, or at least he liked the direction I chose. 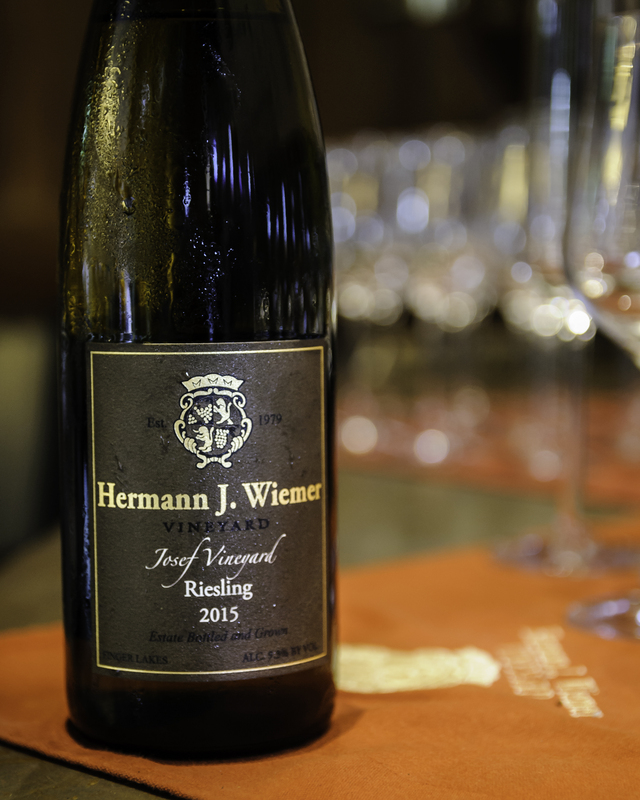 Hermann spent time at the famous Neustadt Viticultural Research Institute in the Pflalz (which I had no idea about until much later); a wine from a vineyard bearing his name that connects to his history? That was, indeed, a marvel. Yet, we were just getting started. After the lovely and voluptuous Magdalena Vineyard Riesling, and the beautifully mineral, and full of apple tones Dry Reserve, Oskar hit us with his fastball — the Josef Vineyard 2015. This was the majesty and masculine power of Rheingau, in a halbtrocken, nearly dry but with a hint of sweetness cloak. That was my “aha” moment. A region that can produce this world-class wine deserves respect. After the Josef Riesling, I knew I had been wrong. I also knew that a few bottles were surely coming home with me, and would be hidden away for years in my cellar in order to mature and develop — this too is key. As much as I love Riesling, I find that the bigger and more complex wines need time. Give the wine 5-7 years and it will reward you with an array of aromatic and textural development; that is where Riesling shines. We concluded our Riesling tasting with a preview of the 2016 vintage. Though rather young, these wines show great promise with rich, ripe stone fruit and a power to match. One wine deserves further discussion — the 2016 Josef Vineyard “Auslese”. Calling this an “auslese” is already an understatement; harvested on November 3rd at 29 Brix — this wine is a monster in disguise; though a sweet, happy, orange and ginger covered monster at that. The wine, which was showing distinct notes of sweetness and botrytis, is full of beautiful orange blossom and ripe apricot notes. This will surely be a showstopper for years to come. We then moved on to the red wines, and here again I was impressed with quality and care. Both the Cabernet Franc and the Lemberger (Blaufränkisch) were excellent examples of both the terroir and the grape. 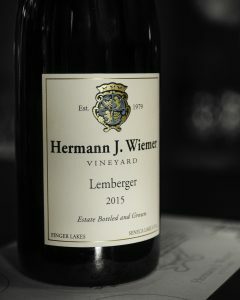 While I personally preferred the Lemberger for its prickle of cranberry-like brightness on the nose and palate, the Cabernet showed class and structure that should age wonderfully. Neither felt under-ripe, my initial fear, nor were marred by overuse of oak. Our tasting ended with a duo of noble select dessert wines. Both the Magdalena and the Joseph vineyard wines were delicious, but my preference was again with the Josef. The wine showed a level of power and complexity rarely seen in new world dessert wines. One thing was clear after the visit (other than the fact that our car was now significantly heavier, for we did not leave empty-handed), Wiemer was proof enough – New York State can clearly make world-class Rieslings, and more. Our second stop in the Finger Lakes was Ravines Wine Cellars. I had not heard of them before, but I trusted my friend’s palate and was eager to taste more. The quaint and rustic barn that houses their Seneca Lake tasting room is worth the visit just for the atmosphere and the food. Beautifully decorated, it evokes both nostalgia and a sense of “home” that is simply ineffable. Ravines is the creation of Lisa and Morten Hallgren, and we were lucky to have the chance to meet and taste with both of them. Morten is the epitome of an Old World winemaker. He was raised in Provence, where his family owns and operates a historic vineyard and farm, as well as a winery. He went on to receive his degree in Enology and Viticulture at the Ecole Nationale Supérieure d’Agronomie in Montpellier. 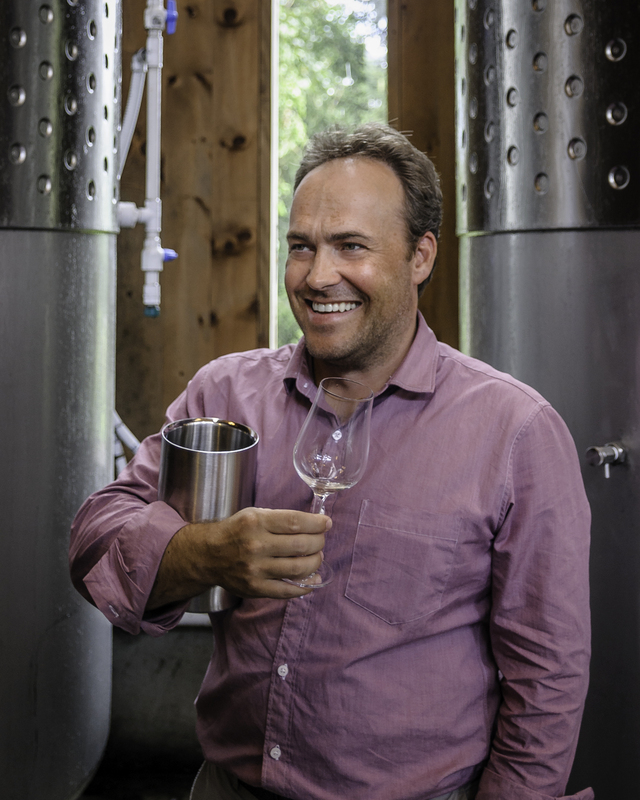 Having spent years as the chief winemaker for Dr. Konstantin Frank on Keuka Lake, Morten knows the Finger Lakes climate and terroir. His wines balance the mineral and cool climate profile of the Finger Lakes, with the careful use of oak and food friendly approach. While my personal interest was in the Rieslings, the barrel samples of the Chardonnay we tasted showed lovely layers of citrus and white flowers, with hints of starfruit and pink grapefruit before the long, zesty finish. The 2015 Gewurztraminer was a surprise as well, full of lychee nut and rosewater, a lovely and floral summer wine. Rieslings were, of course, what I was after. 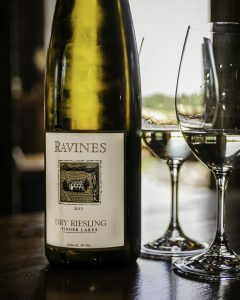 The 2015 Ravines Dry Riesling showed a different side of the Finger Lakes than we saw at Wiemer. Pears and white peaches dominate the nose, while the mid-palate was clean, refreshing, with a hint of grapefruit on the dry and crisp finish. This was already a pleasure to drink on a late summer afternoon, and I can only imagine what a year or two in the cellar would do for this sleek wine. The 2015 White Springs Vineyard Riesling showed a more mineral profile, with the limestone notes dominating the middle before allowing the hints of tropical and stone fruit to take over. While completely dry, the wine finished with a lovely touch of sweet fruit and a hint of spice on the back palate. The sheer balance of the White Springs spoke to me, making me want more, and I have to confess, I took some home with me. We finished our visit by tasting the 2015 Cabernet Franc and the 2014 Maximilien, a Bordeaux blend. Both wines showed structure and cool climate fruit, as well as a lovely savory herb note. They should age wonderfully and I would expect them to develop into classic, food friendly wines, after a few years in the bottle. 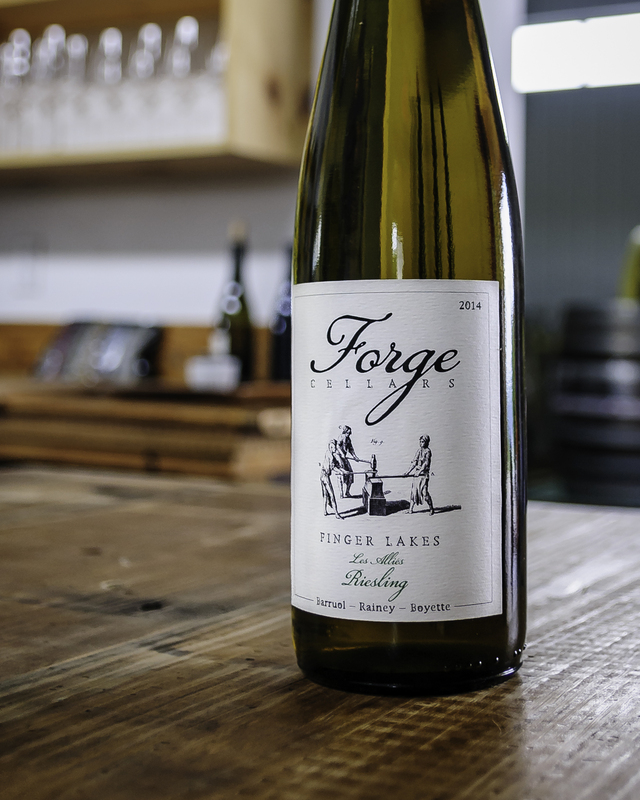 Our third stop was at Forge Cellars, an appointment we arranged through their website ahead of time. 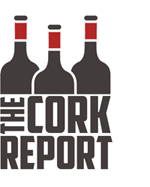 Forge Cellars is a partnership project between Richard Rainey, Justin Boyette and Louis Barruol of Chateau de Saint Cosme in Gigondas. Their first vintage was in 2011 and the absolutely gorgeous, airy and modern winery building has just been completed. That is, if you know where you are going. There is no sign on the main road, nor is the road paved. The best-kept secret is part of the charm — or at least it was for us. As you arrive you may be greeted by one or two ambassadors, Achilles, the white German shepherd, or Patches, assistant winemaker Alexandra Bond’s dog. Alexandra led our group through the tasting. A quick note about the tasting itself, which you can sign up for on their website. This is easily the best-organized tasting we have ever had. A small group of strangers arrives at a given time, sits down at a gorgeous table and is lead through the wines, given both time and opportunity to appreciate and discuss the merits of each. Perfection. Alexandra lead us through the wines, starting with the Rieslings. Forge focuses on two grapes, Riesling and Pinot Noir. Their hands-on (literally), low-intervention approach to the wines, allows the varietal qualities and the terroir to stand out. We began with the Riesling Classique, of which we tried the 2014 and the 2015 vintage. Both were powerful dry wines, with high minerality and lovely citrus note. The 2014 was leaner, with grapefruit and lemon-curd, while the 2015 boasted white peach and a hint of red currants. The wines reminded me of Austrian Federspiel in style, with a powerful middle and a long dry finish. We then moved on to the 2015 single vineyard wines — Sawmill Creek, Lower Caywood and Leidenfrost. Each was unique, with the lithe and mineral forward Sawmill, the burlier, honey-and-apricot Caywood and the funky, salty and stony Leidenfrost. I would be happy with any of these, but the Leidenfrost won my heart with its unique salty tang. If I had to guess, I would place it in the upper Mosel. We also tried the Les Allies Riesling, a unique blend decided on by the team. A complex and unusual wine was the result in 2015, with a ripe core of apricot and a hint of orange blossom on the nose. We then moved on to the reds, or rather the Pinot Noir. Both the Classique and the Les Allies impressed me. The last thing I expected to enjoy in the Finger Lakes was Pinot Noir, and yet… The 2015 Classique was already impressive, earthy tones over sour cherry, not a hint of grassy or herbal notes that can easily mar this delicate grape. A rustic wine indeed, but the beautiful tart cherry notes already hint at its excellent potential. A food-friendly choice, especially for salmon or poultry dishes. The 2014 Les Allies, though, was a clear step ahead, showing notes of mushroom and underbrush over the earthy, mineral-forward mid palate. The wine was clearly cool climate, but unlike anything, I have tasted before. I would consider this a “must try”, and a steal of a deal at that. I confess. I was wrong. 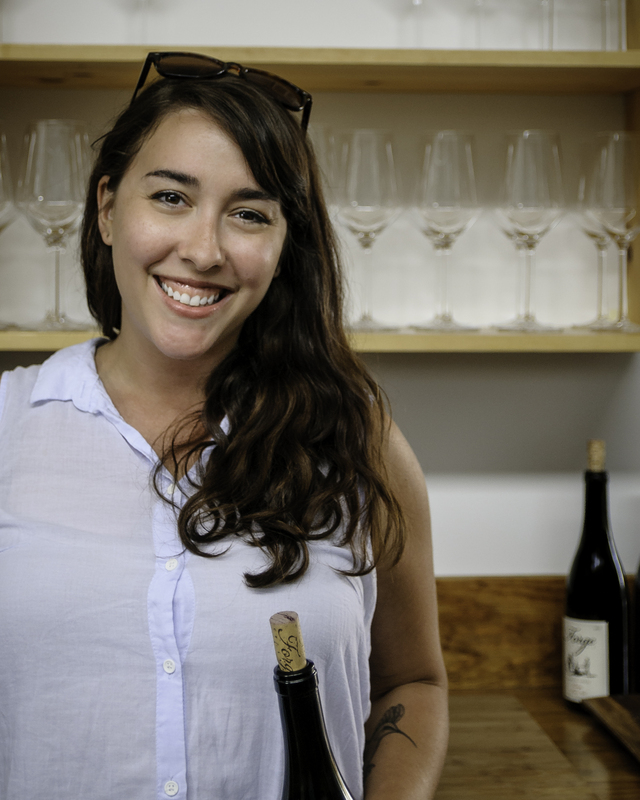 Not only are the Finger Lakes beautiful, of which I had no doubt, bur the people who chose to live and craft here are wonderful and hospitable, but the wines… the wines are really good! I must thank the two people most responsible for this trip, my friends Alan Chan and Lenn Thompson. Both have told me multiple times over the years that I was missing out, and they were right. Nor am I done — the region has many other gems to be discovered, and there is always another vintage — a new challenge and, hopefully, a new success. I would also love to extend a thank you to those we met on this trip, your passion and hospitality were clearly present in the wines we shared. A few parting notes from the Riesling-geek: while I tried to connect the wines to those regions that may be more familiar, these wines are clearly unique. They have their own sensibility, and, if one was to wax poetic, their own soul. I cannot wait to age these and see what develops because I believe that complexity of aged Riesling is what attracts me to the grape in the first place. The other “elephant in the room” is the age of both the vines and the vineyards. The growers and the winemakers are still learning what works in this climate and terroir. The passion and the interest I saw in the Finger Lakes makes me confident that the future of the region is in the right hands, and that future is bright. Couldn’t have picked a better three to start with! And, I’m jealous for your future enjoyment, as I know of several more world class wineries that will amaze you in your future tastings. I can easily name a dozen wineries with under the radar greatness in the Finger Lakes. Thank you! Well written and useful information. I would love to know about other great wineries in the area as we have a girls wine trip scheduled in October. Thank you! i will likely be back there next summer. would love to know some names and get in touch. Red Newt and Colloca Estate both just scored 95 points and Gold for their Rieslings at the 2017 Canberra International Riesling Challenge. Both are worth a visit!